Is it time to reduce your equity exposure? We have seen the market rally significantly after the selling in Q4 2018. Although this is one of the strongest rallies in history, we believe that this is a bear market rally that is about to end. We are taking advantage of this rally and reducing our equity exposure till we get a confirmation of a bull market. Currently the market is trading on technicals. Fundamentally there has not been any improvements this year compared to 2018. In fact, we saw several large companies guide their revenues and earnings lower in Q1 2019. It is important to remember that it is the fundamentals and earnings that drive stock prices and not the technicals. Before we look at the factors that are pointing towards the end of this rally, let’s look at the 2 popular bullish cases that are out there. 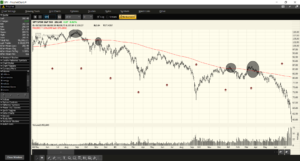 Market is above 200 day moving average: This does not make sense whatsoever as there is nothing magical about the 200 dma. It is just the average price of the last 200 days and does not have anything to do with the fundamental value. If we were to go back to 2008, we will notice that S&P 500 closed above its 200 dma several times but resumed its down trend as fundamentals started worsening. 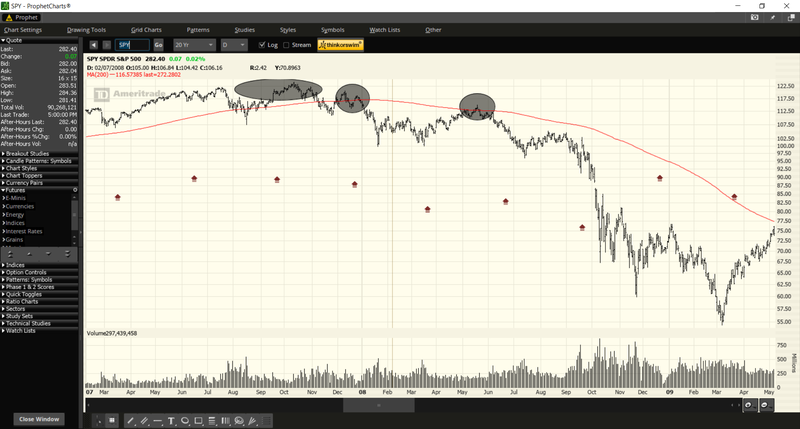 We have seen the same thing happen in 2001-2002 tech crash too as you can see in the chart below. The daily price closed above the 200 dma few times but it eventually failed. We believe that there are few indicators that are better at predicting the market returns over the next 3-12 months. 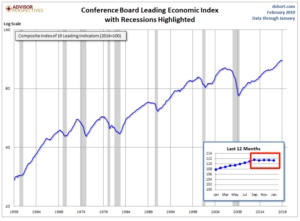 The conference board LEI, Initial Claims and our internal macro model have given us timely warning signals with regards to the long-term trend. These indicators by itself has better odds than random but when we get warning signals from all 3 at the same time, the historical results have been very good. 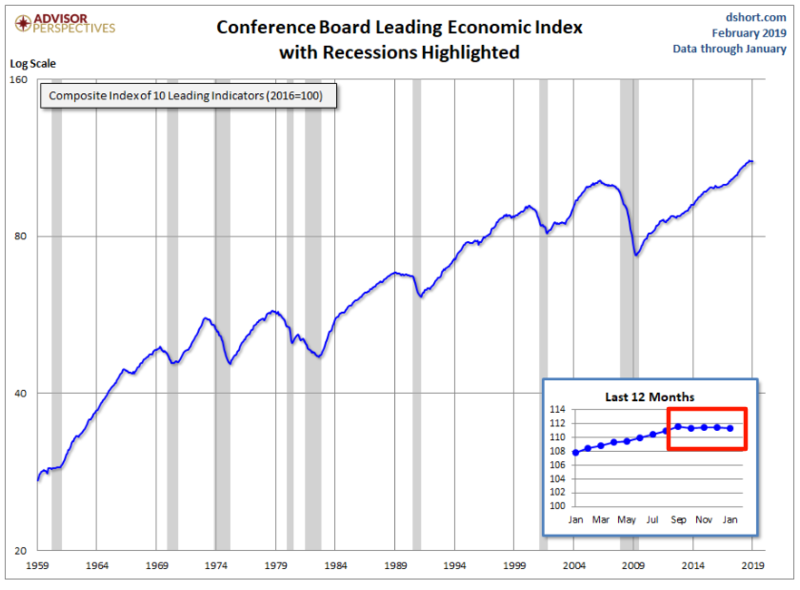 Conference Board LEI: The Conference Board’s Leading Economic Index has gone 4 months without making a new high. Initial Claims: We have one of the lowest unemployment in history. Usually it is a good thing but we might be at a point where unemployment cannot get any lower. Recently we have seen initial claims jump and that could be the beginning of the end of record low unemployment numbers. 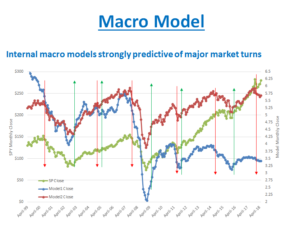 Internal Macro Model: We have developed a macro model that uses several variables that are predictive of the future market returns. Some of those variables are Eurodollar futures, 10-year note, emerging market equities and debt, corporate bonds, US financial index ETF, South Korean export figures, lumber futures and VIX among few more. 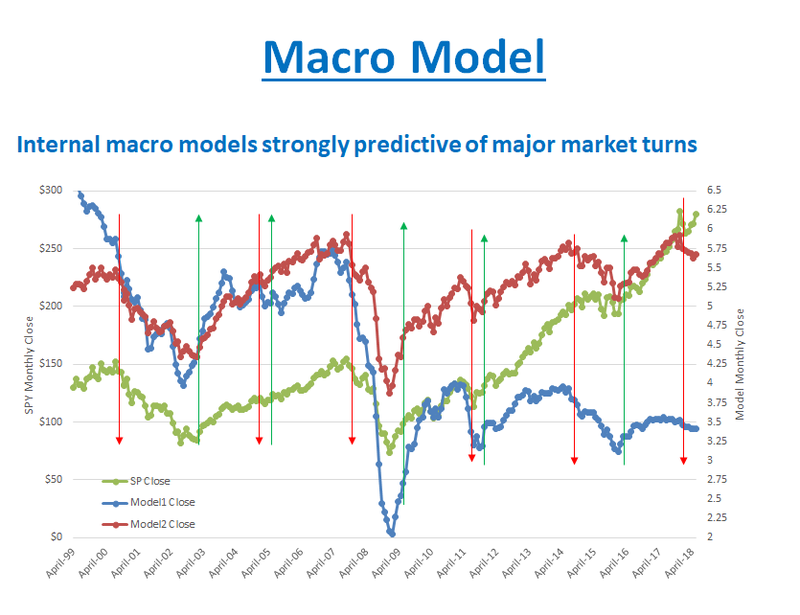 In the last 20 years the model has given 11 signals where 7 were true, 3 were false and 1 is still open. The average gain on true signal is 31% and the average loss on a false signal is 7%. The last signal that we got was in January 2018 and it was a “sell” signal. Here is where it gets more interesting. There were 2 instances when #1 and #2 above happened in the same month. The 2 times it happened were in 12/1973 and 8/2000 and after 12 months S&P 500 lost over 20% both times. Not only that the returns for 1,2,3,6 and 9 months were all negative too. We saw both #1 and #2 above in February 2019. All our analysis is pointing towards a market decline of 20% or more in the next 12 months. 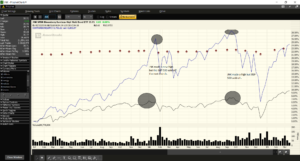 The current rally that started after Christmas 2018 seems to be fading as we are noticing divergence between small caps and large caps. Momentum stocks that seemed to do really well as the rally started has been struggling recently. The chart above compares the FFTY/SPY (black) with S&P 500 (blue). You will notice that FFTY/SPY made a high in December 2017 and it has recently been diverging as S&P 500 is making monthly highs. Historically this has happened near a top and with our macro/longer-term view being bearish, we feel that this is a good opportunity to reduce equity exposure.